Vitamin B-17. Amygdalin. Laetrile. For the most part, the names are interchangeable. No matter what you call it, laetrile has been shown to be one of the most effective (and, to be honest, most controversial) cancer treatments available. Amygdalin is a natural substance found in raw nuts like almonds (amygdalin is the Greek word for almond) and the seeds and kernels of many fruits, particularly apricots. It’s also present in lima beans, clover, sorghum, and other things. The concentrated, purified form developed for use in the laboratory and in treatments is called laetrile. Laetrile Therapy combines amygdalin with other factors to create a potent treatment that fights cancer cells while helping to strengthen the body’s immune system. Although found in various nuts, fruits, and other plants, amygdalin is not a food or “superfood.” (You’ll find an extensive list of foods that contain laetrile below.) And it’s definitely not a drug. Dr. Eugene Krebs Jr., the man who first identified amygdalin, called it a food component or factor. And, although it is not technically a vitamin, food components that are natural, non-toxic, water-soluble, and compatible with human metabolisms — like amygdalin — are called vitamins. That’s why he named his discovery Vitamin B-17. How laetrile fights cancerLaetrile is believed to fight cancer by targeting and killing cancer cells and building the immune system to help fend off future outbreaks of cancer. It actually uses two different methods to accomplish these goals. The first method revolves around enzymes. Healthy cells contain the enzyme rhodanese (in his book World Without Cancer, G. Edward Griffin calls this the protecting enzyme). Rhodanese protects the cells by neutralizing the benzaldehyde and cyanide in B-17, converting them to useful compounds, including thiocyanate, which is known as a natural regulator of blood pressure and also is involved with the production of Vitamin B-12. However, cancer cells do not have rhodanese. Instead, they have an enzyme called beta-glucosidase (Griffin calls this the unlocking enzyme). Beta-glucosidase unlocks the benzaldehyde and cyanide from the glucose to create a targeted poison that kills the cancer cell. G. Edward Griffin explains this process in more detail in World Without Cancer. There’s another method your body fights cancer that is related to laetrile through the power of a healthy immune system. Normally, people produce about 100 billion white blood cells a day. The total white blood cell count normally ranges between 4,000 and 11,000 cells per microliter. These white blood cells attack and destroy anything that is harmful to your body. But cancer cells are covered by a thin protein coating that carries a negative electrostatic charge. This charge repels the negatively charged white blood cells. Luckily, the pancreas emits an enzyme that, in sufficient quantities, can eat away this protective coating, allowing the white blood cells to attack cancer. However, if the pancreas is weak or unhealthy, or if the cancer is growing too fast, the enzyme can’t keep up. That’s where laetrile comes in, fighting cancer while also strengthening the immune system. Because the laetrile might chemically react with the enzyme of a non-cancerous cell (i.e. rhodanese) before it reacts with the enzyme of a cancerous cell (beta-glucosidase) – thus making it ineffective against the cancer cell – you have to take enough laetrile, over a long enough time, to ensure that laetrile molecules hit all of the cancer cells first. One of the positive side effects of laetrile therapy is that more Vitamin B-12 is made in the body. In addition, it’s smart to supplement laetrile therapy with Vitamin C. Vitamin C and Vitamin B-12 can be, by themselves, a treatment for cancer. During an interview with Dr. Antonio Jimenez, chief medical officer and founder of Hope4Cancer Institute in Baja, California, and Cancun, Mexico, he stated that laetrile has several positive effects, including direct anticancer activity (from the cyanide and benzaldehyde described above), analgesic properties, and a general feeling of well-being. He describes Laetrile Therapy as a safe, productive part of an integrative cancer treatment program. Other things rich in laetrile are millet grain and buckwheat grain. Bread made with these grains, however, generally do not contain a high percentage of millet or buckwheat, or else the bread would be too dense and hard. Of course, apricot kernels are the best source of laetrile. In the middle of an apricot (or a peach) is a hard shell. If you break open that shell with a nutcracker, pliers or hammer, you will find a small seed or kernel in the middle that looks like an almond. However, it is much softer than an almond and certainly does not taste like an almond. It is this seed that is rich in natural laetrile. Those who do not yet have cancer might want to plant a few apricot or peach trees in their backyard for a long-term source of laetrile. The kernels can be frozen while still in the shell. The seeds of berry plants, such as red raspberries, black raspberries, strawberries, and cranberries, are rich in laetrile. Even better, red raspberries have a second cancer killer in their seeds: ellagic acid. About four dozen foods have ellagic acid, but red raspberries have the highest concentration. When you buy berry jelly, make sure you buy preserves that have the seeds. Basically, the seeds of any fruit, except citrus fruits, have laetrile. For example, when you eat an apple, it’s a good habit to eat the seeds as well. While there are sources for laetrile pills, they are essentially illegal to sell across state lines. The FDA has made obtaining laetrile supplements almost impossible. However, it is legal to purchase apricot kernels, which contain laetrile. The source that Dr. Tony Jimenez recommends is Apricot Power. Be advised, however, that apricot kernel sites cannot legally make any medical claims about laetrile being used to treat cancer. Laetrile also is legal in Germany and parts of Asia. Overall, amygdalin in pill form is less concentrated and harder to absorb, while I.V. laetrile is more soluble and can be administered in higher concentrations. Also, I.V. laetrile appears to be free from toxicity, while there is a slight chance of problems if the patient consumes too many apricot kernels. The signs of cyanide toxicity include nausea, vomiting, a cherry-red color on the skin, headache, fever, and lethargy. Also, if you obtain laetrile pills, it is important to take them with water before a meal (i.e. with food). In addition, it is important to take enzymes like chymotrypsin and trypsin during the laetrile therapy. However, note that these are blood thinners and should be taken within the vendor's recommended maximum dosage (as stated on the bottle). These enzymes allow the laetrile molecules to work at peak efficiency. Based on his years of experience with laetrile (he first encountered Vitamin B-17 in 1988), Dr. Antonio Jimenez says clinical dosages vary, depending on the method. Laetrile can be administered intravenously, orally through pills, or with intramuscular injections, normally in the buttocks. Intravenously, Dr. Jimenez’s clinics give 3-9 grams a day, usually administered 6-7 days a week, depending on the individual case. The laetrile is diluted in a saline solution and dripped into the patient during a 30-minute time frame. Aside from the debate over apricot seed’s ability to fight cancer, there are other health benefits that come from the presence of laetrile. Laetrile contains special properties that slow down the spread of illness throughout the body by killing harmful cells, but the exact way this is done isn’t fully understood. A study found that the amygdalin present in apricot seeds stimulated the immune system by causing a statistically significant increase in the ability of a patient’s white blood cells to attack harmful cells. One theory is that consuming apricot seeds may help increase the production of pancreatic enzymes that destroy harmful properties within the body. Every person’s health and well-being are dependent on how his or her body removes and purges toxins from the body. With all of the environmental pollution, toxic body care products and processed foods that are unavoidable today, most people are in desperate need of a liver cleanse. By supporting liver function, apricot seeds are also known to enhance the body’s detox effects. A detox rids the body of harmful substances that can lead to illness or infection and provides a liver cleanse, which boosts the immune system. Although some research that tested the components of apricot seeds as anticancer compounds showed no change in cancer cells, some of them reported that patients declared a decrease in pain. In a series of case reports published in 1962, 10 patients with metastatic cancer (meaning it spread from one part of the body to another) were treated with a wide range of doses of intravenous laetrile. Pain relief was the main reported benefit; plus reduced swelling of lymph nodes and decreased tumor size were also reported. In Chinese pharmacology, apricot seeds are used to treat arthritic pain. The fiber present in apricot seeds traps acids and other toxins in the digestive system, pulling them out of the body. The seeds are also detoxifying, so they reduce inflammation in the body and serve as a natural arthritis cure. Arthritis is a joint disease that causes swelling and pain in the joints. Osteoarthritis, a type of arthritis, occurs when cartilage between joints wears down — causing the inflammation and pain. Apricot seeds may cause a low blood pressure reaction due to the formation of thiocyanate, a powerful blood pressure-lowering agent. In the early 20th century, thiocyanate was used in the treatment of hypertension, but it’s no longer used because of reports of toxicity; however, sodium nitroprusside, a metabolite of thiocyanate, is still used for the treatment of a hypertensive emergency. An emergency occurs when blood pressure in the arteries is elevated for an extended period of time, which can lead to health conditions including heart disease, coronary heart disease, stroke, aortic aneurysm, peripheral artery disease and chronic kidney disease. It’s unknown if this is an effective treatment long-term or if the effects are only temporary; research suggests that once amygdalin is metabolized, it causes enzyme beta-glucosidase production that interacts with intestinal bacteria to detox the body and lower blood pressure naturally. Causes of high blood pressure include a high-salt diet, emotional stress, excess alcohol, caffeine overdose, smoking, obesity, inactivity, birth control pills and heavy-metal poisoning. Although the chemical components present in apricot seeds may help to lower blood pressure levels, research suggests that it is not entirely safe. There are a number of other natural remedies for high blood pressurethat can be used without caution. Consuming garlic, fish oil supplements, magnesium and high-fiber foods are safe and effective ways to lower blood pressure levels. You can also try using essential oils that lower blood pressure by dilating arteries, acting as antioxidants to reduce oxidative stress and by decreasing emotional stress. The most effective essential oils for blood pressure are lavender, ylang ylang, clary sage and frankincense. Taken in excess, apricot seeds may produce symptoms of cyanide poisoning, including nausea, fever, rash, headaches, insomnia, increased thirst, weakness, lethargy, mental confusion, nervousness, various aches and pains in joints and muscles, and a drop in blood pressure. In severe cases, cyanide poisoning causes nerve damage, coma or even death. Studies suggest that when using laetrile as a form of cancer or pain treatment, oral laetrile causes more severe side effects than injected laetrile. These side effects can be increased by frequently consuming of apricot seeds and other crushed fruit pits, raw almonds, and fruits or vegetables that contain beta-glucosidase (such as celery, peaches, bean sprouts and carrots). Taking high doses of vitamin C orally, along with laetrile consumption, can also increase your chances of getting cyanide poisoning. Although all of the methods of receiving laetrile have their value, intravenously is considered the best, most-preferred method, followed by pills and then by ingesting apricot kernels. Also, for better results, Dr. Jimenez combines the laetrile in his clinics with Vitamin C and a number of minerals, particularly zinc and selenium. Laetrile has been center stage among alternative cancer treatments and non-traditional medicine for decades. Government agencies have alternately described it as harmless, with nothing to offer patients beyond a positive placebo effect, and as dangerous, because of the cyanide that is part of its core components. Advocates, on the other hand, point to a history of successful treatments, the lack of any proven toxic episodes, freedom of choice issues, and other factors as reasons why it should be legal and available. Let’s take a look at some of the events in laetrile’s history that have led us to where we are today. Laetrile’s role as a food component and its observed ability to fight disease puts it under the purview of the U.S. Food and Drug Administration. And the FDA has long had a contentious relationship with laetrile and with the doctors and patients who want to use it. The following are some of the highlights — and lowlights. The FDA prohibited the interstate shipment of amygdalin and laetrile in 1977. However, 27 U.S. states subsequently legalized the use of amygdalin. It was this controversial conclusion that spurred Ralph Moss into action. You can read more about this compelling story below. However, there were several problems with how the Mayo study was conducted. You can read more about that below. In the 1970s, court cases in several states challenged the FDA's authority to restrict access to what they claimed was a potentially lifesaving drug. More than 20 states passed laws making the use of Laetrile legal. But, after the unanimous Supreme Court ruling in United States v. Rutherford, which established that interstate transport of the compound was illegal, usage fell off dramatically. The FDA continues to seek jail sentences for vendors marketing laetrile for cancer treatment. For example, Jason Vale, a champion arm wrestler and cancer survivor, was sentenced on June 18, 2004, to 63 months in prison and three years of supervised release by a U.S. District Court after running afoul of the FDA for selling apricot seeds online as a cancer-fighting tool. The laetrile was working for Vale, yet he still ended up in prison. While it remains a banned substance in the U.S. for retailers to sell, it’s not illegal to possess or use. Also, it’s legal in Mexico, where quality-controlled laetrile production for medicinal purposes is still supported. Dr. Antonio Jimenez points out that anyone who comes to Mexico can take laetrile back to their home country with a prescription. The term “toxic” generally means the substance is poisonous when taken in low doses. Under this definition, laetrile is not toxic. Yet, although laetrile is a safe nutrient to take therapeutically, there are precautions you should take. Remember, too much water at one time can have fatal effects on the human body. One or two cups of coffee is a pleasure, but 10 cups in one day could have serious effects on the nervous system. The same can be said for laetrile — too much is a bad thing. Luckily your body is programmed to tell you when “enough is enough. ” If you have ingested too many apricot seeds or laetrile, the major signs of cyanide poisoning include dizziness, blurred vision, and nausea. If any of these symptoms occur, simply decrease the next dose. Despite the fear that these side effects may bring on, the occurrence is extremely rare if common sense and moderation are followed. In fact, in more than two decades of clinical use, Dr. Antonio Jimenez has never seen a patient with cyanide toxicity. He also points out that in the dosages used by qualified practitioners, laetrile is not toxic. If you want to read an interesting story about laetrile, read the first chapter of Alive and Well, an online book by Dr. Philip E. Binzel. Two famous studies on laetrile at the Mayo Clinic claimed that laetrile was toxic and that some of the patients in the studies had cyanide poisoning. It should be noted that many of the people at the Mayo Clinic who did these studies had also participated in three Vitamin C studies to attempt to discredit a study done by two-time Nobel Prize winner Linus Pauling. However, the Mayo Clinic did not follow standard American protocol and dosages for Laetrile Therapy. For example, if they had followed the standard laetrile diet, which is virtually the same thing as a “raw food” diet, the diet alone would have significantly extended the lives of the patients. In addition, the National Institutes of Health, which funded the studies, did not allow an alternative treatment vendor to supply the proper laetrile for at least one of the studies, even though they offered to do so for free. Cecile Hoffman and the Cancer Control SocietyThe CCS was officially started in 1973. But the real story goes back to 1959 and to a woman named Cecile Hoffman. Cecile Hoffman was a schoolteacher in San Diego. In 1959, she underwent a radical mastectomy. The doctors told her they had gotten all of the cancer. But they were wrong; the cancer came back, and she was given months to live. It was about this time that her husband, a chemist, happened upon the book Laetrile: Control for Cancer” by Greg Kittler. He was impressed by the book and the science behind it. He learned that laetrile comes from a natural substance called amygdalin that’s found in the pips of many fruits, like apricots, and in raw nuts. Laetrile targets and kills cancer cells and also builds the immune system to fend off future outbreaks. So the Hoffmans headed to Montreal, Canada, to the McNaughton Foundation, an early leader in Laetrile Therapy for cancer patients. Cecile started the treatment — and it worked. She began to recover. However, when they got back to San Diego, they discovered that Laetrile Therapy wasn’t approved by the U.S. government. Her doctor refused to continue the treatment. So they began looking for a doctor who would. They soon found Dr. Ernesto Contreras Sr., a pathologist and oncologist in Tijuana, Mexico. Dr. Contreras opened Oasis of Hope Hospital in 1963. He explored literally hundreds of treatments — including laetrile — in his quest to help patients. Today, he’s remembered as a pioneer in using integrative medicine to advance cancer research, treatment, and control. “Dr. Contreras agreed to administer laetrile to me,” Cecile said later. He also promised — at Cecile’s request — to keep accurate records and data to give to the McNaughton Research Foundation in Montreal. By March 1964, X-rays showed that Cecile’s tumors had disappeared. The Laetrile Therapy was proving successful. Cecile wanted to let her friend, supporters and others know about her success with alternative treatments. So she established the International Association of Cancer Victims and Friends. Today, the IACVF is known as the International Association of Cancer Victors and Friends. Cecile ultimately died in 1969 — 10 years after orthodox medicine left her for dead. Ralph Moss and Second OpinionIn 1974, Ralph Moss, a novice science writer, was hired by the PR department at Memorial Sloan-Kettering Cancer Center. Sloan-Kettering was America's top cancer research center at the time. Moss was supposed to help brief the public on the center's contribution to the War On Cancer. The center had been tasked with testing one of the most quackish of all “quack” remedies. Of course, that was laetrile. Originally a laetrile skeptic, Moss planned to write a biography on this iconic scientist. But he soon discovered that Dr. Sugiura had been studying this laetrile in laboratory mice for nearly two years — and had seen unexpectedly positive results. Moss reported back to his superiors what he had discovered, but faced denial of what their own leading scientist had found. They instead cited other studies that showed little success with laetrile. They basically killed laetrile as a viable option. But Moss refused to give up. Fueled by respect and admiration for Dr. Sugiura, Moss spent more than four years in his attempts to publicize the scientist’s positive findings. He wanted to leak materials to the public. Moss went first to the Committee for Freedom of Choice in Medicine. But that group was associated with the ultra right-wing John Birch Society. The Birchers were too fringe for Moss, too easy for the public to dismiss. He went next to a politically active group called Science for the People. But they were skeptical of laetrile. So he and some colleagues formed an underground organization called Second Opinion. They began publishing documents taken from Sloan-Kettering that detailed Dr. Sugiura’s successful test results. At the same time, Moss continued working at Sloan-Kettering. Ultimately, he was fired after coming forward as a member of Second Opinion. This is a thumbnail sketch of a very small part of a huge laetrile story. Want to know more about Ralph Moss and his experiences? 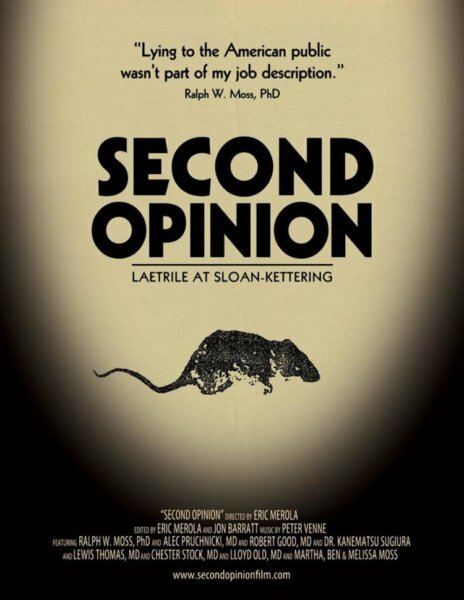 Check out the powerful documentary Second Opinion: Laetrile at Sloan-Kettering at FMTV (Food Matters TV) or Amazon Prime. This specific therapy comes from the Binzel book Alive and Well, mentioned earlier. The Binzel Diet is similar to a typical vegan diet minus citrus fruits. 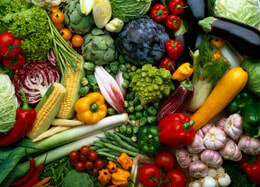 The Binzel Diet comprises fresh vegetables, fruits, grains, and vegetable proteins. The enzymes present in fresh non-citric fruits, such as apples, peaches and pears, and vegetables greatly contribute to good nutrition. 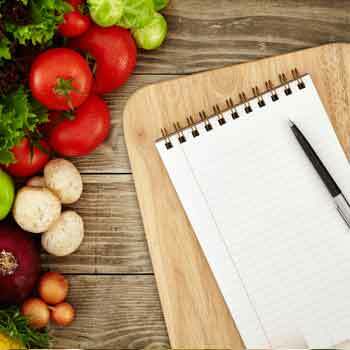 Patients are urged to have lots of salads, fruits, whole grain foods like pasta and brown bread. The diet discourages sugar, fat, and any thing that is animal or an animal by-product. This means abstinence from all kinds of meat, fish, eggs, and even dairy products, and stress is placed on a high fiber diet. “Laetrile is nothing more than a concentrated form of nitrilosides,” Binzel said. When ingested, nitriloside has merited recognition by maintaining non-toxic cyanide levels and acting as a potential threat to the immune surveillance, thereby lessening the frequency of cancerous tumors. The most common clinical appearance of nitriloside is as amygdalin (laetrile) and in natural form in berries, apricot and peach kernels, grape seeds, blackberries, strawberries, bean sprouts, lima beans, macadamia nuts, and other fruits. It is recommended that you give preference to fruits (i.e. seeds), grains, and nuts (e.g. almonds and macadamia) that are rich in laetrile. Also, make sure you get the nutrients that are necessary in order for laetrile to work. If you are already taking a multivitamin, compare its ingredients with the below list and take extra supplements to make up any deficiency. If you are not already taking a multivitamin, the recommended way to get all of these nutrients is through a high quality daily multivitamin like MegaFood vitamins or O.N.E.™ Multivitamin. Binzel also adds Megazyme Forte for its trypsin, chymotrypsin, bromelain and zinc nutrients — two pills three times a day. Other pancreatic enzymes (also known as proteolytic enzymes) are Vitalzym and Wobenzym N.
Whenever you combine two or more alternative cancer treatments together, it is critical to do your homework. For example, Vitamin C, Zinc, and Selenium should be taken with laetrile; however, Vitamin C should not be taken with Protocel, Graviola (e.g. Amazon Factor Protocol), hydrazine sulfate, etc. In other words, if you are taking a second or third alternative cancer treatment with laetrile, or if laetrile is being used to supplement another treatment, be careful to watch the warnings on each treatment. If the patient cannot afford one of the major home protocols, they should combine laetrile with the Dirt Cheap Protocol. Advice for doctors considering laetrileThe clinics operated by Dr. Antonio Jimenez have extensive clinical experience with laetrile. According to Dr. Jimenez, the most beneficial method for Laetrile Therapy is intravenous, especially for advanced cases of cancer. Intramuscular is not as effective, primarily because it is painful and patients often don’t want to comply with the regimen. Dr. Jimenez stresses that practitioners (and patients) need to be patient. Laetrile takes time. The expectations initially should be to improve the quality of the patient’s life and slow progression of the disease. Many patients believe laetrile is a magic bullet. Explain to them that it is not. Laetrile is not a solo answer. Cancer is a multifactorial disease, driven by a variety of components. Laetrile should be part of a broad, integrative plan. One thing to note is that laetrile is not selective for any particular type of cancer. In other words, it is potentially effective for all cancers. However, Dr. Jimenez says, they have not confirmed that yet; they will have to see the effects at the cell level, as well in respect to clinical results, i.e. how the patients are responding. Before you embark on a laetrile regimen (or any other integrative or alternative cancer treatment plan), be sure to talk it over with your physician or other medical professionals. Also, it is important to note that laetrile is not always the best treatment in every situation. For example, with fast-spreading cancers, laetrile may not be strong enough to defeat cancer even if the patient is on a superb raw food diet. Unless you are using high doses of a quality source of laetrile under a doctor’s supervision, you should not depend on laetrile as the core treatment in a cancer treatment program. Treat this as a supplemental treatment or a remission treatment. As Dr. Jimenez says, laetrile is safe and effective, but it should be part of an integrative oncology program. And we encourage you to explore Cancer Tutor to learn more about the wealth of natural and integrative cancer treatments available. Whether you call it laetrile or amygdalin or Vitamin B-17, this natural substance has been shown to be an effective weapon against cancer. Laetrile is primarily found in apricot kernels, as well as in thousands of nuts, fruits, and other sources. But it is not without controversy. Critics say it is at best ineffective and at worst potentially toxic. Advocates point to years of positive results and no known cases of cyanide toxicity. Laetrile has been banned in the U.S., but it is administered legally in several clinics in Mexico as well as in Germany and parts of Asia, usually intravenously in high doses. What’s more, apricot kernels and apricot-based pills can be purchased in the U.S. and taken as a nutritional supplement by cancer sufferers and by others hoping to prevent cancer. As with all medical treatments, it is important to talk it over with your doctor or other health professional. Laetrile (also known as amygdalin and Vitamin B-17) is a natural substance that has been shown to be a safe, effective, and non-toxic treatment for cancer while simultaneously helping to strengthen the body’s immune system. What is the difference between “Vitamin” B17 (Amygdalin) and laetrile? B-17 is a naturally occurring compound found in raw nuts and more than 1,200 other foods. Laetrile is a synthesized compound that is used primarily for cancer treatments. How does laetrile fight cancer? Amygdalin is made up of glucose plus two potentially toxic substances, benzaldehyde, and hydrogen cyanide. Healthy cells contain the enzyme rhodanese (in his book, World Without Cancer, G. Edward Griffin calls this the protecting enzyme). Rhodanese protects the cells by neutralizing the benzaldehyde and cyanide in B-17, converting them to useful compounds, including thiocyanate, which is known as a natural regulator of blood pressure and also is involved with the production of Vitamin B-12. However, cancer cells do not have rhodanese. Instead, they have a large amount of an enzyme called beta-glucosidase (Griffin calls this the unlocking enzyme). Beta-glucosidase unlocks the benzaldehyde and cyanide from the glucose to create a targeted poison that kills the cancer cell. Yes. Doctor Jimenez noted in his interview that he has been using Laetrile in his clinic since 1988 at very high doses and has never seen a serious toxic reaction. Doctor Jimenez notes that your body will tell you when you have had enough. Typical signs of too much laetrile would include nausea, vomiting, cherry red color on skin, headache, fever, or becoming lethargic. What are the main foods that contain laetrile? While it’s found in more than 1,200 different foods, the primary source of laetrile for therapeutic purposes is apricot kernels. Other common sources include peach kernels, bitter almonds, grape seeds, apple seeds, raspberries, blackberries, blueberries, strawberries, cranberries, and plums. Also, millet grain and buckwheat grain are rich in amygdalin, but bread made with these generally don’t contain a high enough percentage of the grains, or else the bread would be too dense and hard. Where can I get laetrile? Laetrile I.V. therapy and laetrile pills are illegal in the U.S. However, you can legally buy apricot kernels, which contain laetrile, from a number of sources. Dr. Tony Jimenez recommend the 500 mg tablets from Apricot Power. Clinics in Mexico (as well as in Germany and parts of Asia) offer high-concentration I.V. laetrile under the supervision of professional medical staff. For active cancer patients, Dr. Antonio Jimenez recommends anywhere between 20 and 40 kernels a day. The variance depends on the patient’s history, where the cancer is located, how advanced it is, and other factors. As a preventive measure for everybody or for patients in remission, he recommends 14-16 kernels a day. If you are interested in learning more about Laetrile, here are some of the resources that we used to compile this article. Second Opinion — watch it on Food Matters or Amazon Prime. For more general information about cancer and cancer treatments, check out Common Questions Cancer Patients Ask. It is interesting to note that there are cultures today who remain almost entirely cancer-free. The Abkhasians, the Azerbaijanis, the Hunzas, the Eskimaux and the Karakorum all live on foodstuffs rich in nitriloside or Vitamin B17.